Anyone who has a cat in their home is familiar with the feline desire to get on your kitchen countertops. If you're wondering how to keep cats off counters, there are several options to keep your counters cat-free. There are many options to repel cats and keep them away from counters. Using cleaners or essential oils that smell like citrus can work for some cats. Essential oils such as lemon, wild orange, lavender, lemongrass, lime, peppermint, and eucalyptus can be used to deter cats by diluting a tiny amount in water (one drop of oil per 50 drops of water at a maximum). You should never place essential oils on a cat or anywhere they can walk on it and lick it off their paws. 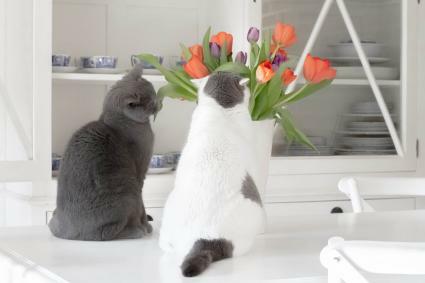 Some cats dislike the smell of certain plants and simply placing one in a nice, attractive pot can deter your cat from getting on the counter. Some plants that cats are known to avoid are rue, lavender, rosemary, and pennyroyal. Another trick used by many cat owners is to set up a "trap" on the counter. When the cat jumps on it, a loud noisy event scares the cat off. The trap can consist of items along the edge of the counter such as aluminum cans, either empty or filled with coins and stacks of cookie sheets, baking pans, or cooking pots. SSSCAT is a motion-activated device that shoots out an odorless burst of air to scare the cat off. The air burst is like what you would get using a can of compressed air to dust off your computer keyboard. You can also use noise yourself by having a noisemaker on hand and using it when you observe the cat jumping onto the counter. Some options are small noise horns, party noisemakers, or personal alarms. A repellent cats dislike the feel of is double-sided tape or carpet runner mats turned upside down so the rubber nubs point upward. Another option is crumpled up aluminum foil or packing tape. ScatMat is a motion-activated item which is a flat mat you lay on top of the counter or on the floor underneath it. Touching the mat shocks the cat when he or she lands on it. The problem with repellants is they don't teach the cat what you want them to do. Cats are sensitive to their environment and can become anxious and develop more problematic behaviors after experiencing unpleasant events. Likewise, if you have a cat with a bolder temperament, he may find ways to maneuver around your repellants. Cats are intelligent so it's not unrealistic for one to figure out how to enjoy a rest on the counter despite the obstacles. Training your cat to avoid the counters by providing reinforcement for an alternate behavior has minimal to no risk of negative fallout for the cat's well-being. It is essential to understand why they want to be on your counters and meeting that need in other ways that make you both happy. Cats have a natural affinity for climbing and being up high. If you look at the counter from a cat's eyes, it's a nice space for them to jump on and spread out and enjoy the view. It's also a place they may be lucky enough to find food. Your cat may have been rewarded for being on the counter. You may want them off, but it's possible other household members have been feeding into the behavior because they enjoy it. 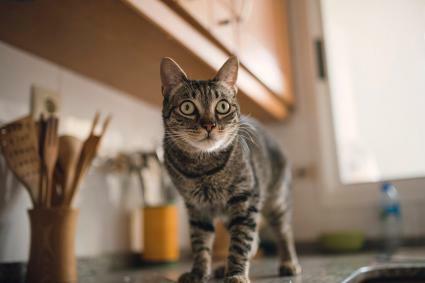 If your cat is getting on the counter most often when you are in the kitchen, he most likely is jumping up because he enjoys being with you and wants to keep you company. If you live in a household with more than one pet, your cat may be scared and getting onto the counter to feel safe. This is especially true if the source of the stress can't follow the cat onto the counter, such as a dog or small child. Bored cats will look for things to do to liven up their daily routines. Counters have lots of fun and interesting things to explore. It may also be a sign your cat is sick. If the cat is getting up to get to water from the faucet or sink, it's possible your cat is experiencing an unhealthy level of thirst. If this is a new behavior, a trip to the veterinarian is recommended to make sure your cat isn't suffering from diabetes or malfunctioning kidneys. 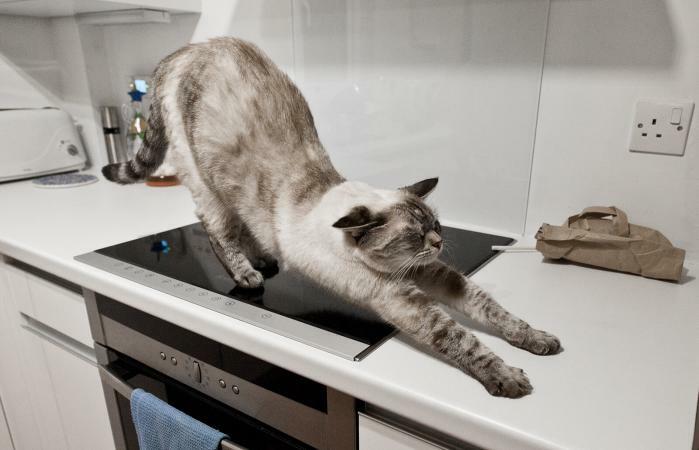 Your training plan will be based on the question posed by Certified Cat Behavior Consultant Adria Karlsson, "If I don't want my cat on the counter, what do I want my cat to do instead?" Make sure everyone in the house agrees on the plan and follows it consistently. Make sure your counters are clear of any items your cat may want. Be diligent about keeping your counters continuously clean. Remove or fix items attractive to your cat. These include dripping faucets, plants, or anything shiny that might remind the cat of a toy. If there are windows above the counters block the views outside using privacy film. Keep your cat out of the kitchen while you are preparing your or the cat's food. Close the door if you have one or use baby gates. Your cat may howl or paw at the door or gate. Ignore him and set him up for success with some fun toys for him to play with on his side of the gate or have another person there to play with or brush him. Provide an alternate spot where you want your cat to be. When you're not actively preparing food, let the cat in the kitchen and set up a cat tree right next to the counter advises Associate Applied Animal Behaviorist Katenna Jones. "Leave random snacks on the cat tree for the cat to find and reward the cat with a food treat, brushing, or play with a toy whenever you see him jump on it on his own." Jones also advises setting up a motion sensor on the tree that can alert you to when the cat jumps on it and you are not there to observe, or use a "treat and train"or camera/treat dispenser device if you have room to fit it safely on the cat tree. This way you can reward them more often and more immediately for doing what you want. If you don't have the room for a full cat tree, another option is to install a shelf or a perch by a window or any other area they are using the counter to get to. You can also set up a chair or a stepping stool for your cat to lay on in the kitchen so they can be with you while you're there in an acceptable resting space. Increase your cat's environmental enrichment. This includes at least one good play session a day with you and cat toys and providing multiple high places. These can be cat trees, window perches, cat beds, and outdoor enclosures. Foraging toys are also a great way for cats to burn off energy and use their brains. You may find your cat still gets on the counters from time to time despite your training plan. Behaviorist Jones advises owners to accept they "may never get the cat to stay off the counters 100 percent of the time but being consistent, diligent and focused on providing your cat with alternate outlets can greatly reduce the behavior while keeping your relationship with your cat positive and healthy."